Twenty Five Lusk in San Francisco’s SOMA district combines a dynamic restaurant, lounge and bar, offering creative cuisine, beautiful domestic and international wines, and inspired cocktails. 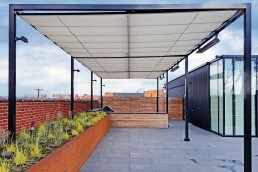 Award-winning architect Cass Calder Smith won top honors for weaving a modern style paying homage to the existing 1917 brick and timber warehouse. 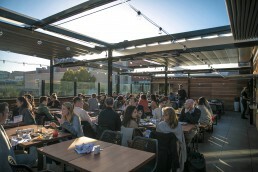 The five-star loft-like establishment is made up of three distinct spaces: The Dining Room, The Social, and the recently renovated ROOFTOP 25 – each offering their own unique ambiance. 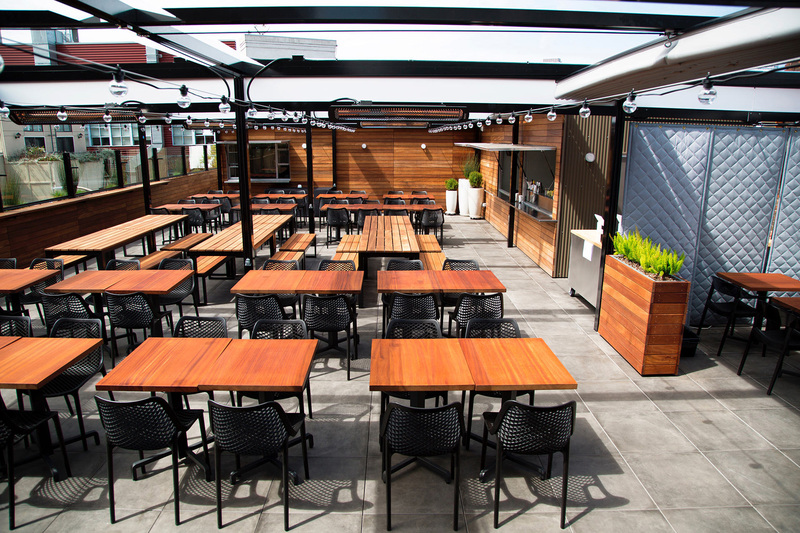 ROOFTOP 25 offers casual outdoor seating with upbeat music and city views. 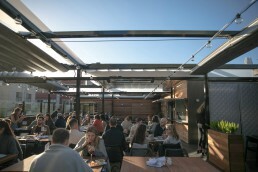 Delicious wood-fired hand-crafted pizzas, burgers and shrimp tacos as well as chilled ceviches and lots of other fabulous bites. 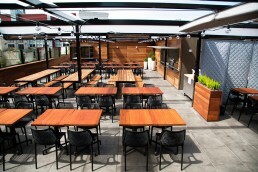 The ROOFTOP 25 Bar serves up ice cold beers and fantastic frozen cocktails such as the spicy Passionfruit Margarita and John Daly to other favorites like the house Sangria and Pina Coladas just to name a few. 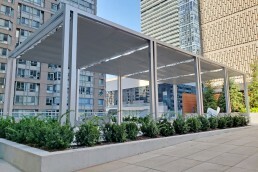 Partnering with Niam 563 Lusk LLC, ShadeFX delivered seven custom attached aluminum structures, equipped with rain gutters, and fire-retardant retractable underside canopies. 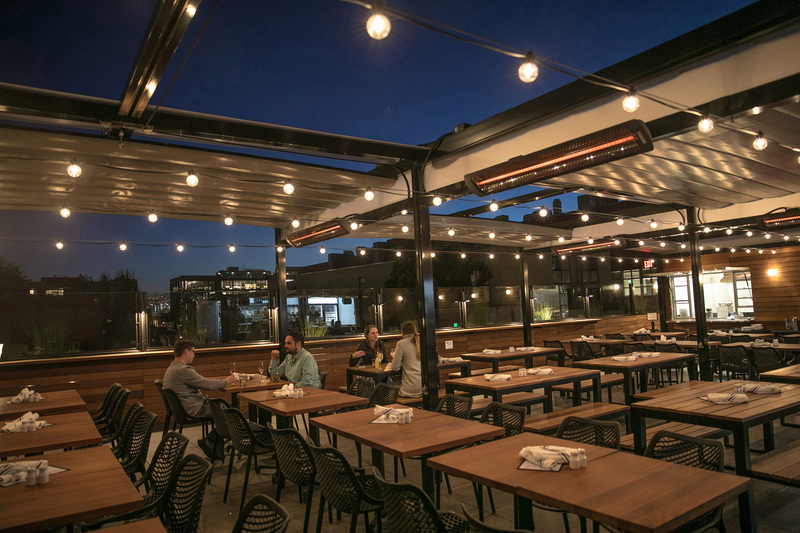 The specifying process considered many variables including integration of patio heaters onto the structure, reduction of fabric swag (or as we like to call it ‘Canopy Drop’) to accommodate lighting, and post placement to maximize seating capacity. 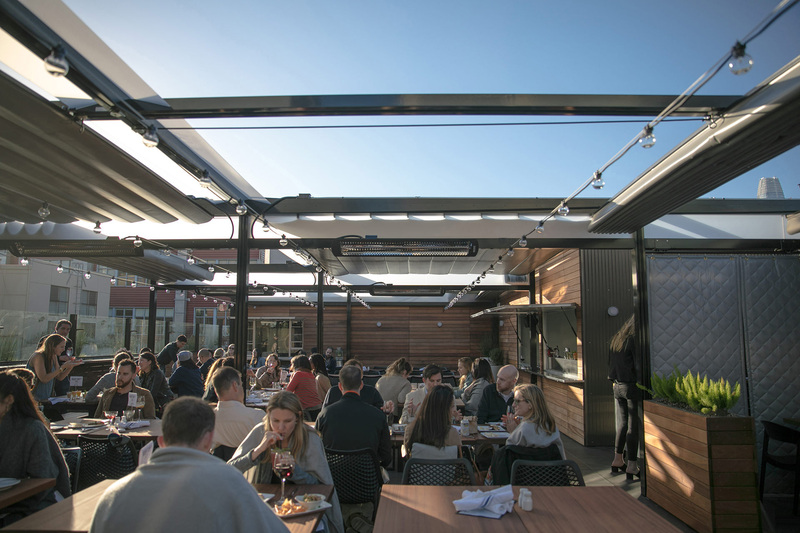 The end result, nearly 1,300 square feet of sun and rain protection, providing a watertight area that protects the patrons, the patio furniture, and waiting staff. 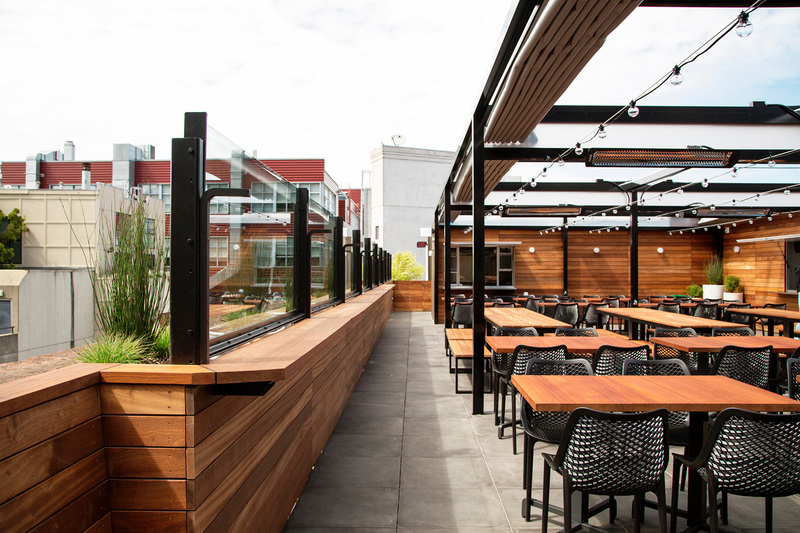 Transforming the relatively unprotected patio into a year-round functional space, with an emphasis on comfort, has increased the rooftops seating capacity, patron length of stay, and patio revenue. Gone are the days of squeezing the chair up to the edge of the table in an attempt to stay dry, or constantly repositioning the chair around the table to chase the shadows of the umbrella. Welcome to the days of pulling up a chair, sipping on a cocktail, and taking in the views with great company all while remaining absolutely carefree about the pending forecast. 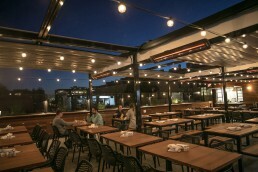 Twenty Five Lusk’s newest addition, Rooftop 25 offers casual outdoor seating with upbeat music and city views. 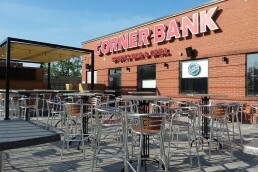 With over 1,250 sq. ft. of protected and heated seating, the rooftop is open year-round, rain or sun-shine. Elegant finishes, including quilted curtains and stringer lighting create a level of comfort and intimacy unmatched in the San Francisco Bay Area.